DUMFRIES & GALLOWAY is set to take a starring role in a UK-wide tourism campaign to inspire young people to take short breaks at home that contribute to their self-development. The new campaign by VisitEngland, launched in October 2018, and aims to encourage UK millennials to take breaks here at home while still experiencing enriching opportunities similar to those associated with a traditional gap year abroad. The campaign is being supported by VisitScotland as well as the national tourism organisations of Northern Ireland and Wales, and tourism businesses and destination management organisations across the UK. A ‘micro-gap’ targets young people living in the UK to take part in activities to improve their wellbeing, discover local flavours, learn new skills and support good causes all within a short-break of two-to-three nights. 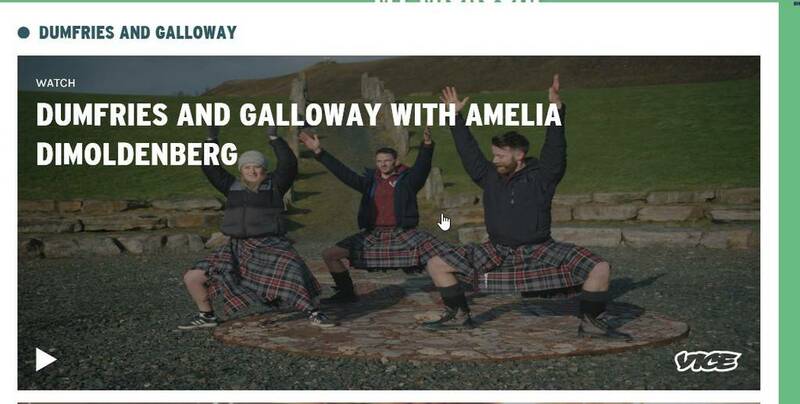 As part of VisitEngland’s ‘#MyMicrogap’ campaign, London-based social media influencer Amelia Dimoldenberg recently travelled to Dumfries & Galloway on a ‘microgap’. She took part in a variety of activities including yoga with Kilted Yoga sensation Finlay Wilson and Alan Lambi at Crawick Multiverse near Sanquhar, as well as a local ghost and history tour of the region conducted by Mostly Ghostly. Amelia also learned about the production of ethical ice cream at the Cream O’Galloway café as well as a trip to Laggan Outdoors to experience one of Europe’s longest Zip wires. VisitBritain/VisitEngland Director of Marketing Clare Mullin said that whether learning a new skill, volunteering or ticking off a bucket list activity, the UK was packed full of life-enriching experiences right here on our doorstep. “From mastering the pottery wheel at a ceramics course to walking with alpacas, from canoeing to soaking up live music, we want young people to take a new look at the adventures, experiences and destinations on offer.